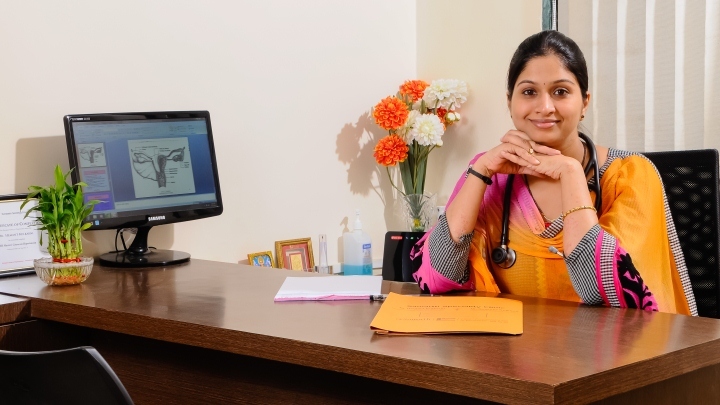 Dr. Sowmya Kulkarni is an eminent Gynecologist and Fertility specialists from Pune. She has been into private practice since 2010 and has gained rich professional experience in a short span of time. Dr. Kulkarni is a MBBS graduate from JJM Medical College located in Davangere, Karnataka. She further opted for Master of Surgery (MS) in Obstetrics & Gynecology, an extensive post graduate training programme in the field of female reproductive health and a surgical - medical specialty in clinical pathology. Prior to engaging in private practice, Dr. Kulkarni delved in academic activities. She devoted around three years tutoring numerous medical aspirants at B J Medical College, Pune as an Assistant Professor in Department of Obstetrics & Gynaecology. Dr. Kulkarni has an active participation in research activities too. Presently, Dr. Kulkarni is offers her services as a Panel Consultant at some of the best hospitals in Pune like Apple Hospital (Vishal Nagar), Shaswat Hospital (Aundh) and ONP Tulip Hospital (S B Road). Besides this, she also is available for consultation in the morning and evening hours at her private clinic Samarth Speciality Clinic, Wakad. With expertise in pregnancy, childbirth and disorders of the reproductive system, Dr. Kulkarni provides high-quality health care to all women patients who avail her medical advice and services. Conducted research on ‘Role of Oral Hydration Therapy in Patients with Oligohydramnios’ which formed a part of dissertation. Presented paper ‘Eclampsia – A Hospital based Study’ published in The Medical Journal of Western India. Former Assistant Professor in Department of Obstetrics and Gynaecology at B J Medical College, Pune. © 2018 , Dr. Sowmya Kulkarni.